The Strathcona Baptist Church has been a fixture in its area for over a hundred years now. The brick church seen below was later replaced but the congregation remains. You’ll also see St. Anthony’s Catholic School and the old and “new” St. Anthony’s Churches in the background of the 1912 picture below. St. Anthony’s Catholic School and the old St. Anthony’s wooden chapel still exist, although the school has been heavily renovated to serve as an administrative centre and the wooden church has been moved to 1905 Street at Fort Edmonton Park. This entry was posted in Uncategorized and tagged 104 Street, 84 Ave, Churches, edmonton, St. Anthony's Catholic Church, St. Anthony's Catholic School, Strathcona, Strathcona Baptist Church on June 17, 2014 by Yesterworld. So, I considered posting these images to Vintage Edmonton because looking at the EdHGIS maps was not working out for me. As I wrote in a prior post, I acquired a few rare original photos of Strathcona and Edmonton from the 1900s and wanted to figure out who took them and sent them to England. I had pictures of this person’s house but little idea of where it was (aside from an educated guess that it was east of 102 street and probably north of Whyte Ave. This entry was posted in John Doe Strathconan Collection and tagged 1900s, 84 Ave, Brackman-Ker Milling Co., edmonton, Percy Bartram, Strathcona on June 13, 2014 by Yesterworld. This is another photo from my John Doe Strathconan collection. In addition to this photo I have already posted a photo he took in the modern-day area of King Edward School and I know that he took pictures of the Strathcona CPR tracks (which I could not afford to buy), so there is good evidence that John Doe lived east of 102 Street. On the other hand, he took pictures in the area of Walter’s Mill (which also were too rich for my blood), so I am not sure. Walter’s Mill was a fair bit west of the area seen below, so I am still left with a bit of a mystery. Click on image above for a much larger version. 1. Moravian Church: Under construction in 1908. 2. Holy Trinity Anglican Church: The original wooden church can be seen in the photograph. By 1914 it had been moved and the current brick church had been built in its place. 3. 9946 – 84 Ave: Formerly 412 – Second Ave North, this building is gone today but was matched to this site via the 1914 Fire Insurance Maps. 4. 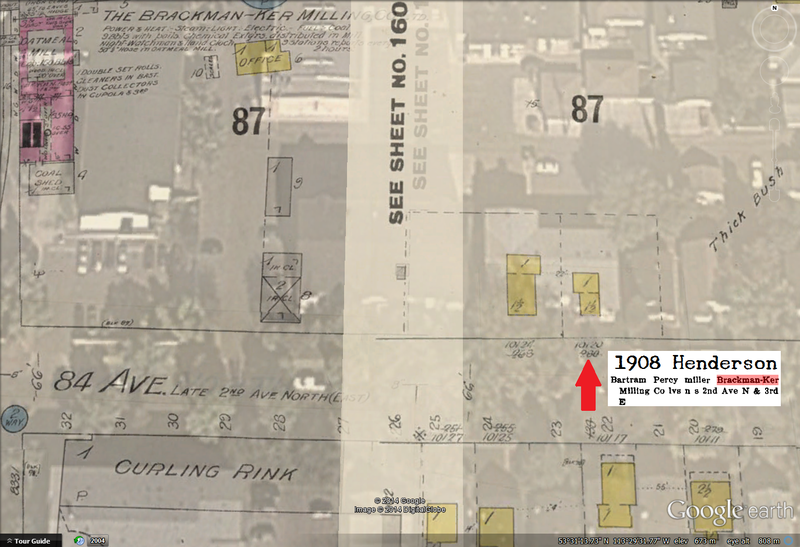 9947 – 84 Ave: This is the house we see in the distance in the 1908 photo. In the photo it looks like it is just in front of the Moravian Church but it is actually a block nearer to the photographer. This entry was posted in John Doe Strathconan Collection and tagged 100 Street, 101 Street, 1900s, 84 Ave, 99 Street, Churches, edmonton, Holy Trinity Anglican Church, Strathcona, Strathcona Moravian Church on June 13, 2014 by Yesterworld. There are many other buildings in the 1910 postcard but these are the most recognizable of them. This entry was posted in Uncategorized and tagged 104 Street, 105 Street, 83 Ave, 84 Ave, Churches, edmonton, Metropolitan Methodist Church, Niblock Street School, St. Anthony's Catholic Church, Strathcona on June 12, 2014 by Yesterworld. Left to Right: City Offices, Old Fire Hall, Fire Hall No. 6. 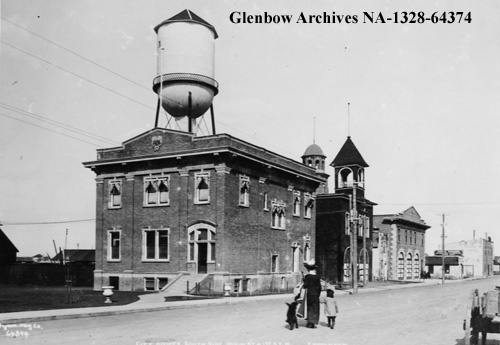 This entry was posted in Uncategorized and tagged 104 Street, 1910s, 84 Ave, City Halls, Fire Hall No. 6, fire halls, Strathcona on June 1, 2014 by Yesterworld.